Scouting soybeans: Scouting is a general field survey designed to measure the level of pests or their damage. In soybean, scouting is used to identify fields that may get economic loss from foliage feeders (from several types of insects) or pod feeders (corn earworm or stink bug). 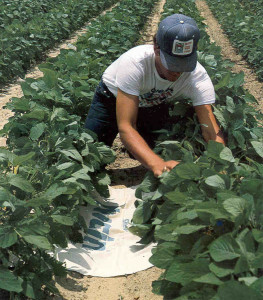 The technique used is also influenced by the row width and sampling device employed, when sampling corn earworm and stink bugs. For added information on soybean insect scouting see the NC Soybean Scouting Guide or download the Soybean Insect Guide. Scouting for foliage feeding insects. Scouting for foliage- feeding insects involves estimating the percentage of the total leaf surface that has been eaten by insects. The method for taking a single sample is to move to the sample site, look up and down the row at nearby plants and leaves, and estimate the percentage defoliation on the plants observed. Record this estimate and repeat the procedure for all samples. After the last sample is taken, average the individual defoliation estimates over all the samples taken and compare this average estimate to the defoliation threshold. Beginners often overestimate the extent of defoliation. One way to help “calibrate” the eye is as follows: (a) look at a single plant and estimate the percentage of defoliation — record this estimate, (b) remove the plant from the ground and pull all the leaves from the plant, (c) estimate the percentage of area eaten from each leaf — folding the leaves into quarters will help, and (d) calculate the average defoliation (add the individual defoliation estimates and divide by the number of leaves). The individual leaf estimate should be most accurate and the first whole plant estimate should be compared to the leaf based score to judge the accuracy of the first estimate. Use this procedure for practice until the scout becomes proficient at estimating whole plant defoliation. When scouting fields, each field should be sampled at a minimum of three sites (one sample per two acres with a minimum of three samples and maximum of 10 samples). Extra large fields should be divided into units not larger than approximately 30 acres (e.g. a 45 acre field would be divided into two units of approximately 22 acres each). If the defoliation level is clearly well above the threshold, or if it is near zero, after the first three samples have been taken – and if casual observations between sampling sites confirm the sampling results – further sampling is usually unnecessary. When foliage injury is encountered, the scout should determine which insect(s) is responsible and if population will cause further damage if not treated. Each field should have a significant portion of the area scouted. Patterns of scouting are usually dictated by the travel pattern between fields, access, and field size and shape. Many patterns can be successfully employed. A “U” or “Figure 8” are good patterns to use. Samples should be widely spaced within the pattern used. Scouting for corn earworm. The corn earworm often functions as a foliage-feeder and is described under foliage-feeding caterpillars for this situation. However, it prefers to eat blooms and fruit (pods). Therefore, when plants are in the reproductive growth stage this caterpillar is sampled as a pod feeder. The corn earworm is the most damaging insect found on North Carolina soybeans. It’s feeding can reduce yields and delay plant maturity. The sampling method used for the corn earworm after bloom depends upon the crop row width. For rows greater than 30 inches, a shake cloth (a 3 ft. X 3 ft. cloth sometimes called a beat sheet or ground cloth) is used. The cloth is unfolded between two rows, and plants along the row for 3 feet on each side of the shake cloth (6 row feet) are struck downward with the hand and forearm to dislodge caterpillars onto the sheet. 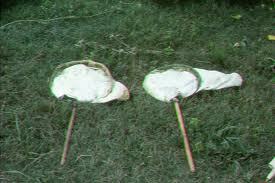 Care must be taken to prevent the plants from sweeping across the sheet and displacing insects. Earworms that fall onto the cloth are counted, making sure that the worms are properly identified and not confused with other commonly found species of worms. The size of the larvae should be noted as this information is needed in making control decisions. NOTE: The corn earworm is more attracted to open areas in soybeans and to field edges. Therefore, make sure that samples are collected away from the borders and in average areas of the field. Calculate the average number of caterpillars per six foot sample and compare this number to the appropriate threshold given below. 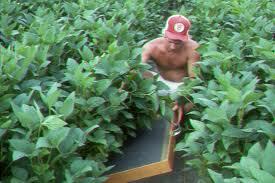 Using a shake cloth in narrow-row soybeans (less than 30 inches) is not practical. 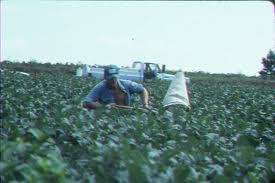 In fields with rows less than 30 inches a rigid beat cloth or sweep net must be used. The rigid beat cloth, which measures 2 ft. high X 3 ft. long X 4 in. deep (a shallow box), is not available commercially and thus must be home built. Sweep nets should be 15 inches in diameter and strongly made. To take a sample with the rigid beat cloth, place it gently on the ground between the soybean rows at about a 45o angle, gently bend the plant(s) over the open side of the device, and strike the foliage sharply with the forearm or stick, although not vigorously enough to “trampoline” the caterpillars off the sampler surface (the procedure is similar to that used with a beat cloth in soybeans planted at conventional row widths). Sample two 7″ rows simultaneously (side by side rows) or one row if at or above 14 inch row width. Count the corn earworms and compare the number of caterpillars averaged over all samples to the economic threshold listed for the row width sampled and anticipated selling price. Each sweep net sample consists of 15 separate sweeps done continuously, one after another; this is one sample. Each of the 15 sweeps per sample is made by briskly thrusting the net downward in an arc of about 3 feet and perpendicular to the plant rows. Make the sweeps from one side to the other and parallel to the ground. Vigorously thrust the net about 15 inches deep into the foliage on each sweep; with the top of the net opening even with the top of the plant canopy. Each sweep should cover 5, 3, or 2 rows of 7 inch, 14 inch, or 21 inch rows, respectively. While sweeping, pace down the row taking one sweep per step for 15 paces. The sweeps must be vigorous enough to dislodge the insects and a properly done sample will contain some leaves. Separate the corn earworms from the leaves and count them. Average the number of caterpillars over the samples taken and compare this average to the threshold for the appropriate row width and selling price. With any sampling device and any row width, the number of samples taken is dictated by field size. Take a minimum of three samples per field, and take an additional sample for every 3 acres in fields over 6 acres – for example, in a 6-acre field, take three samples; in a 9-acre field, four samples; in a 21 acre field, seven samples; and so on. If the threshold is greatly exceeded (e.g. 4 times higher), or if no caterpillars are found after three samples, no further sampling is needed. Scouting for stink bugs. Scout for stink bugs when checking for corn earworms in August, using the same procedures. However, most stink bug infestations will occur later than corn earworm, in late August through early October. The beat cloth (wide rows), rigid beat cloth (narrow rows), or sweep net (narrow rows) can be used. Follow the guidelines for sampler use as described for corn earworm. However, due to the more varied distribution of stink bugs, a greater number of samples must be taken. Take 10 shake sheet or rigid beat cloth samples per field, or 12 sweep net samples per field. For fields below 5 acres 50% fewer samples may be taken. Groups of small nymphs (less than 1/2 inch long) should be counted as one adult or large nymph. Large nymphs (longer than 1/2 inch) should be counted together with adults.